Headbands of Hope - Bring Hope to a Girl Fighting Cancer! Every once in a while, something comes along that touches your heart in a way you never felt possible. Maybe it's because I recently found out that I'm pregnant with a girl this time around, but when I heard about Headbands of Hope, I immediately knew I had to help. Last week, Jessica emailed me to tell me about this organization she started last year after an internship with Make a Wish Foundation. She got to know some young girls who had lost their hair as a result of the aggressive chemo treatments they had to undergo. She realized that headbands would be the perfect way to for these girls to keep their feminine identity and have a constant reminder that they’re not alone. Girls just like Tori, who is fighting neuroblastoma. Once upon a time, we had a wish girl who was a beautiful 4-year-old girl named Renee. Her wish was to go to Disney World to meet her favorite princess, Sleeping Beauty. Unfortunately, Renee's cancer took a turn for the worse during Christmas time last year, a couple weeks before her wish. The doctors sent her home from the hospital to be with her family becuase her time left was short. Since she couldn't go to Sleeping Beauty, we decided to bring Sleeping Beauty to her. We rented a Sleeping Beauty dress that I wore and I brought her a matching dress, a wand, and a crown with "Princess Renee" written on it. I also brought the sleeping beauty story to read to her. Before we came, her mother called and said she hasn't opened her eyes in 3 days, but she can hear everything we're saying. I arrived in my royal limo to Renee's house where her mom, dad and two sisters awaited me. I gave them a princess greeting and then went to Renee's bed in their living room where she was wearing a beautiful pink headband. I sat down on her bed beside her and put my hand on her shoulder, so she could feel that Sleeping Beauty was there. I started to read her the story of her favorite princess (my biography I called it) and she opened her eyes and saw Sleeping Beauty sitting with her on her bed. The family cried as I said "I remember when I woke up after a hundred years!" trying to stay in character. That time with Renee is a moment I will never forget. The doctor said she wasn't going to last to Christmas, but she lived a week after that, until we got a phone call from her mother saying Renee had passed away. However, her mother said Renee was buried in the dress, crown and wand that Sleeping Beauty gave her. Her mother said she was more at peace with Renee passing because she knew she got what she always wanted, to meet Sleeping Beauty. At this moment, I knew I had to start something new and fresh to help these kids. I thought of Renee and the headband she wore, and all of the other girls I met who wore headbands when they were battling cancer. After a couple thinking sessions with a pad and pencil in Starbucks...Headbands of Hope was born. As soon as I read Jessica’s email, I knew I had to help. I immediately visited the website and bought my own headband. 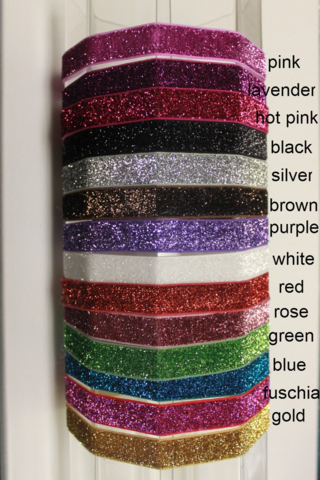 The Go Glitter headbands are only $8.75 and it’s already my new favorite workout accessory. Not only do I love the headband, I love what it represents. But that's not the only type of headband you can buy. There's the Classic Shabby and the Skinny Shabby, or if you want something a little fancier, you can get one of the Beaded Beauties or even a couture headband! The mission at Headbands of Hope is to fund research for childhood cancer and spread hope in all girls, one headband at a time. Will you help spread hope? Order a headband today! Which headband would YOU order to help spread HOPE?